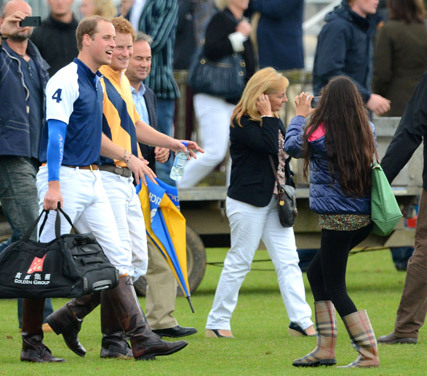 Prince William and Prince Harry made one young fan’s day this weekend as she snapped some once-in-a-lifetime pictures of the royal brothers at a polo match in Gloucestershire. The handsome pair was walking across a polo field in their sportswear when the girl rushed over to them to take some photos on her iPhone. The princes smiled for the camera and after capturing her close-up shot, the animated fan turned to her friends and screamed in delight, much to the amusement of the two brothers. The royals were taking part in the International Audi Polo event at the Beaufort Polo Club competing in opposing teams during the match. Prince William attended the event without wife Kate Middleton, who is now on maternity leave ahead of the birth of the royal baby next month. And it wasn’t just the younger fans that the princes had an impact on. The brothers were pictured chatting to a number of mystery women throughout the day, as well as playing with a bunch of cute toddlers. Be still, our beating heart. Last year, the Duke and Duchess of Cambridge attended the polo event together, bringing their black cocker spaniel puppy Lupo along for the day too.